By now I’m sure this is old news, but since I’m newly energized with electricity… I’m a little late. Ok, so we had this huge storm. I mean a HUGE storm. In other places they’re called hurricanes, each assigned with cute little names, everyone evacuates and Anderson Cooper is on the next flight in. Here in Astoria we wheel in our rubbish cans, put on a pot of coffee and hold on (we had reported gusts of over 100 mph). I took it upon myself to name this storm “Nellie Olson”. A pesky little twit she was, and she brought us back to Walnut Grove times. Some here are still living in Walnut Grove… STILL with no electricity! I have fantasized about living like Laura Ingalls Wilder, a simple time with a simple life… living off the land and lunch in little buckets. Our night in the storm changed all that. Our house was filled with candles (thank you IKEA), the fireplace roaring (thank you WIND for finding your way down our chimney), and hot coffee provided by DH who boiled water on the campstove outside (thank you FRENCH PRESS). We played checkers, watched trees sway, I did some redwork (thank you HILLARY LANG!) by lantern light (so very Ma Ingalls, though I’m guessing hers was not a Hello Kitty lantern). We watched my newly cleaned windows get pelted with pine needles and branches praying they didn’t break. Dinner was an epicurean delight of hot dogs roasted in the fireplace. No news and no tv… but I did have one tower on my crackberry and I was able to go to kgw.com to get a little news. Note to self… keep crackberry fully charged before next storm. Like Ma reading us a story before the fire, we listened to DH’s scanner and could hear all that was going on in the county. Stormotainment. I never could have imagined how many wonderful people were out there making it safer and better for us out there! Thank you to all of you! At around 1 am things start to settle down and things eventually become quiet. Really quiet. WOW… our lives are so filled with noise, that once you’re without power… it’s so quiet! We had DS sleep in our room, away from the trees on his side of the house. We all tucked in for the night (a cold night at that) and I slept better then I have in years! Ahh… so quiet! Time to wake up to our morning alarm clocks… the sounds of chain saws. Up the street, down the street. Here a chain saw, there a chain saw… everywhere a chain saw. This is the point where DH is envious and I can smell a trip to Lowes in the air. I thought we had it bad… downed and damaged fencing, a snapped tree (a big one) and my glass patio table that went airborne onto the lawn (which yes… we did vacuum!). No more photos of my coffee on the table for PKM. For me the mess was the worst. Cleaning the sidewalk, the yard, blah, blah, blah. Cleaning is so not my gig. And then I found out about my neighbor Wende and her mess… first I saw it IRL and then on her blog. I’m not feeling a bit sorry for myself… only gratefulness. The storm also brought out us neighbors. Hot coffee and cigarettes served up fresh in my driveway as we planned a pot luck with our thawing food (thank you again FRENCH PRESS and campstove). The power did go back on before our big feast, so no Little House on the Prairie style cooking… but it was a blast. Long story short… we’re still cleaning up and getting the fencing back up. DH got to go on his fantasy Lowes shopping extravaganza and got his new chain saw. Can you smell the testosterone? The fencing was a sting on the wallet… but soooo nothing compared to what others have to deal with. After cutting the snapped tree, DS discovered we had a great view from atop the tree and snapped this photo of Astoria at dusk. I really like this photo even though it’s hard to see. And that my friends… was our night with Nellie Olson. OH. MY. GOD. I love French Press coffee, so now I just need a campstove to boil water on. 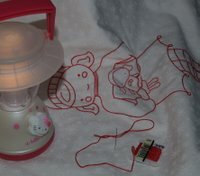 And HELLO KITTY LANTERN THANK YOU VERY MUCH. 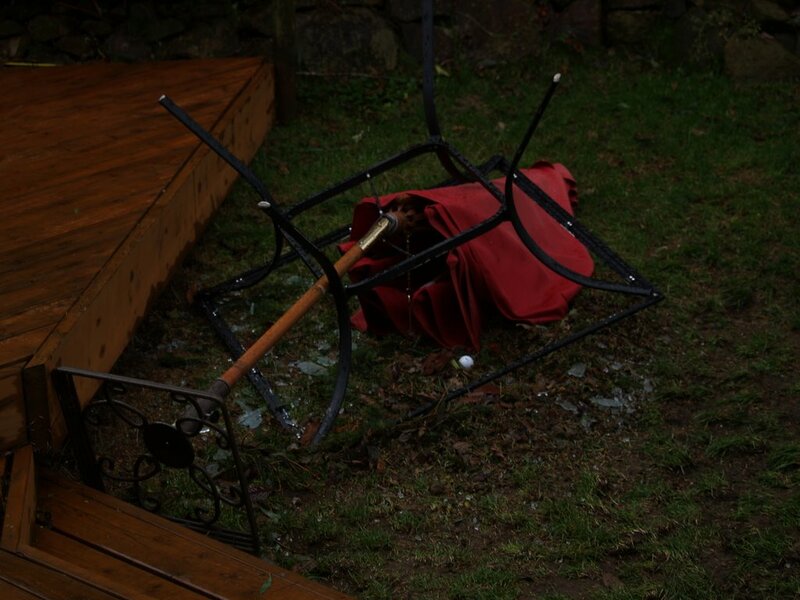 All kidding aside, glad there was no serious damage. Heh… the Hello Kitty Lantern ROCKS! Good old Nellie—what a storm. I’m glad it’s over and I’ll think twice before complaining about the rain from now on. 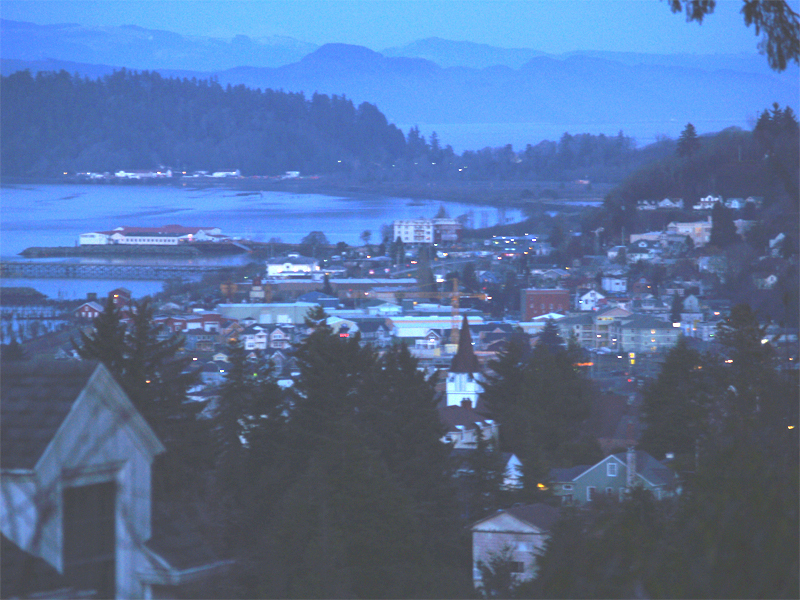 Astoria looks really pretty! I’ve never been. That’s a great view. We would have been so cold if our power went out. No real fireplace, no propane in our propane tank. Yikes. Your house looks a lot less cluttered than mine. I hope to work on that in the new year. It looks festive in your house! Glad to see that you guys weathered Nellie so well! So sorry about your fence, though. Love that you named our little storm Nellie. We were very big “Little House” fans growing up. We actually lived like that for a summer while Dad was building our log house. Too fun! Wow-what an ordeal! I’m glad you all are safe. I, too used to wish I lived in simpler times, like Laura Ingalls, but then we moved to Texas and I realized I couldn’t survive without air-conditioning. I love the name you gave the storm - it’s perfect! I loved that show, and hated Nellie - and her mother - just like everyone else did. We didn’t fare too badly here - power out only a few hours and shingles missing from the roof but that was it. Trees came down around town but nothing like the Puget Sound area. Pictures of the damage there are horrible - I imagine there is much similar destruction to be seen on the coast. Oh Nellie!!! That sounds kind of nice except for the dangerous storm part, the broken fence part, and the broken table part…you know what I mean. One of my friends always says, Ma Ingalls never had Mother’s Day Out so why do we need it…and all the other things Ma Ingalls didn’t have. We’re spoiled huh? Glad you’re okay, I’d be sad if I missed my scalloped edged Happy Zombie fix. Merry Christmas! Merry Christmas, Monica! Here’s to a great new year!